On Sunday 5th September 2010 some of our club's keen cyclists gathered at Manchester's Velodrome, our National Cycle Centre and home to the British Cycling team. Our intrepid group included Frank Griffiths, Nick Thompson with wife Babeth and son Nicholas plus Richard Porter and his daughter Nicole. 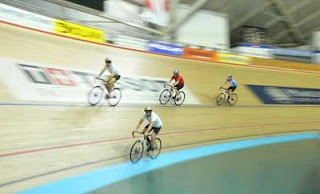 The Velodrome novices received an introduction to the track plus some essential tuition and tips. Essential not only because of the imposing banked track, but also becuase the bikes - with just one fixed gear, no free-wheeling and no brakes - are very different to your usual road or mountain bike. After absorbing these instructions, they set off on a few exploratory anticlockwise circuits of the track, initially keeping to the narrow blue band, or 'côte d'azur', a flat strip lying in between the banked track and the central 'infield' area (as shown on the left). Why anticlockwise - well it's a tradition, one that can be traced back to the times of Roman chariots, and has continued to the present day and athletic stadium track events. After a while it was time to tentatively move beyond the côte d'azur. Slowly climbing ever higher on each 250 metre lap to finally experience that strangely satisfying effect of centrifugal force around the bends, immediately followed by the heady rush of speed as the bikes swoop down the straights. At its highest the banking rises as high as a two-story house, a dramatic, exhilarating and unique experience. ﻿﻿﻿﻿﻿Many found circling the track required slightly more pedalling effort than they originally thought. And soon realised a need to retain some energy in the legs - no brakes means slowing down involves applying pressure back against the pedals. Nevertheless, everyone was able to find their own comfort zone in terms of speed and height on the track. An experience summed up by Babeth's comment, "accessible to everyone, as easy or as hard as you want it to be". Climbing higher up the track they passed other zone markings, including the optimum racing route, defined as the area between the black and red lines. As the more confident cyclists ventured still higher up the the wall, the visual effects became more extreme. Richard in particular commented on how strange it was to "look down from on high as I passed other cyclists below me", noting that these riders "appeared noticeably smaller and a little distant". By the end of the session all agreed what a unique and unforgettable experience it was, to be able to ride the same track and experience the same thrills as Olympic cycling stars Sir Chris Hoy, Chris Boardman and Victoria Pendleton (Chris and Victoria are shown on the left) - albeit at slightly slower speeds! The day was summed up by comments such as "I had never thought of doing that before" and "fantastic, let's do it again". Taster sessions lasting one hour, with instruction, are available to everyone aged 9 or over. With 2010 prices of £9.80 for adults and a £7.70 concession including a bike and helmet, plus a small charge for shoe hire, it's exceptional value for money. 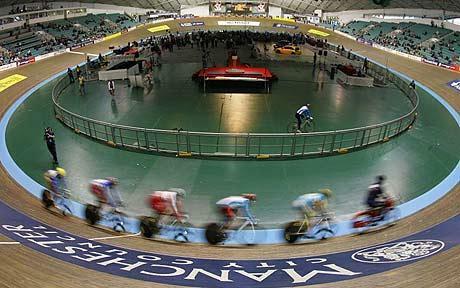 The velodrome is also open to visitors, who can watch the experts training, and maybe pick up a few tips. 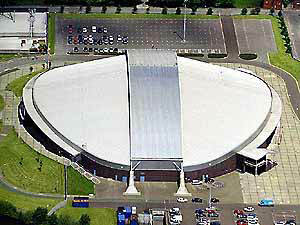 For more Velodrome pictures visit the National Cycling Center's Flickr site.